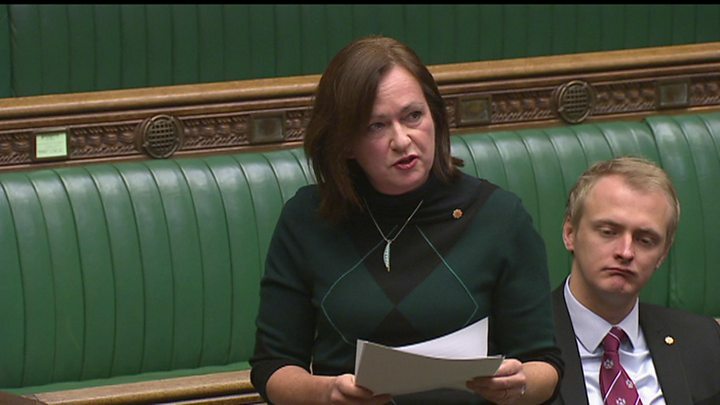 Media captionLiz Saville Roberts: "Victims of abuse are obliged by current court protocol to face their abusers"
A Plaid Cymru MP wants to change the law to stop victims of abuse from having to face their abusers in court. Liz Saville Roberts's bill aims to stop abusers making claims to the Civil and Family Court, simply to further harass their victims. The cases mainly involve the victims of domestic abuse, harassment and stalking. The Dwyfor Meirionnydd MP also said restraining orders and sanctions for breaching them should be strengthened. The Voice4Victims campaign has expressed concern about the practice of abusers taking court proceedings out against their victims, saying police did not always rule this to be a breach of a restraining order. One example involved a woman whose ex-partner - under a restraining order after being charged with stalking - had taken her to court 15 times, costing his victim about £25,000 as she did not qualify for legal aid. Campaigners said all his claims had been baseless, including false allegations of assault for which the victim was arrested. In another case, a stalker was able to cross-examine his male victim in court despite being the subject of a restraining order. The bill aims to make it possible for victims to alert the court of any restraining orders or relevant convictions against the applicant. It also places a duty on the court to investigate and specifies applicants must declare any convictions. The bill would also strengthen the sanctions available to the courts for a breach of a restraining or other restrictive order. Image caption Liz Saville Roberts said victims had to endure "harassment and humiliation"
Ms Saville Roberts, Plaid Cymru's parliamentary leader, said it was about "proper protection for victims of abuse". "Convicted perpetrators are being allowed to make vexatious claims in the civil and family courts as a means of further harassing their victims," she added. "Victims are being taken back to court to face their abusers for no reason other than to be further abused by their perpetrators, even when those perpetrators have restraining orders against them. "That some of these victims are forced to face cross-examination by their abusers is deeply disturbing and this bill will make sure victims are no longer forced to endure such harassment and humiliation." Harry Fletcher, co-director of Voice4Victims, added his support, saying: "Victims must be at the centre of the justice system, not in its margins."